Did you know vitamin E is one of the most essential nutrients for your overall health? While it has a wide range of benefits, vitamin E is mostly used to slow aging and prevent disease. Vitamin E is a fat-soluble antioxidant that protects cells from free radicals. Free radicals are unstable atoms because they tend to build up by latching onto other atoms, causing oxidative stress. Unfortunately, this quickly and easily leads to cell damage in the body. By blocking the build-up of these atoms, Vitamin E promotes slow aging in the hair, skin and eyes while also preventing the risk for heart attack and stroke. Some studies even show a potential link to vitamin E with slower memory decline associated with Alzheimer’s disease and other forms of dementia. With its wide range of benefits, physicians highly recommend getting enough of the vitamin. Unfortunately, sufficient vitamin E is not often found in a variety of foods. Wheat germ oil is the number one food item where you can find the most vitamin E. However, it is doubtful most people want to eat that by the spoonful every day. Other foods like sunflower seeds, avocados, almonds, cooked spinach, broccoli and peanuts are all foods that contain relatively high amounts of vitamin E. However, even then, they don’t come close to providing the recommended daily amount of the vitamin. While Cooper Complete always recommends prioritizing vitamin intake through food and taking a multivitamin additionally, vitamin E is a nutrient most aren’t getting nearly enough of through food alone, making a multivitamin all the more necessary. While Vitamin E is crucial for overall health, it is merely one factor of many that makes up a healthy, well-balanced diet; it is not a supplement to take by itself. Vitamin E works as a team with vitamin C through complimenting each other’s functions in the body. Vitamin C restores vitamin E’s antioxidant function so that it can continue to fight tissue damage caused by oxidative stress. In addition to vitamin E, vitamin C also plays a key role in a healthy body through assisting vitamin E in free radical protection and immune system support. However, unlike vitamin E, vitamin C can is present in a variety of foods. Aside from the obvious oranges, vitamin C is heavily concentrated in grapefruit, peppers, broccoli and strawberries. Luckily, it is uncommon to develop a vitamin C deficiency considering it is so easily accessible through everyday foods. However, vitamin C and vitamin E work as a team to help the body function properly. Simply put, one cannot do its job without the other. Vitamin A is also crucial to an overall healthy lifestyle. With its immune system, body growth and reproductive health benefits, it has also proven to be necessary to ensuring other vitamins are performing their proper function. Beef liver, sweet potatoes, spinach and carrots are high in Vitamin A. Much like vitamin C, it is very rare to develop a deficiency of the nutrient. However, vitamin A also needs vitamin C and E to properly perform its functions. Much like vitamin C, vitamin E and vitamin A, all of the nutrients we consume work together to keep the body healthy and balanced. In order to get the recommended daily amounts of all nutrients to maintain your health, consider a multivitamin supplement. At Cooper Complete, we offer to fit the individual needs of every lifestyle. 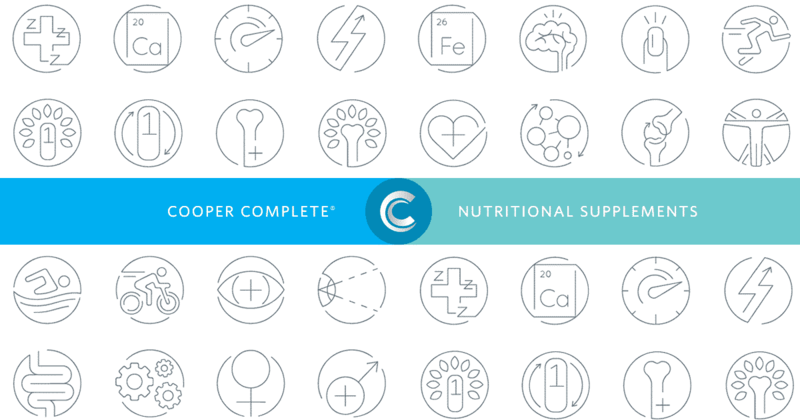 Taking the right supplements for you is one of the 8 steps to get Cooperized.